Graptolites had a relatively simple construction, and this is especially true for the planktic graptoloids. 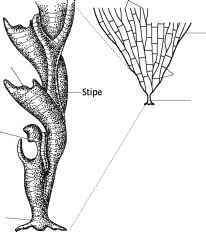 Benthic species built branches, or stipes, made of several types of cups, or thecae, in which the zooids lived. These thecae stick out from the stipe at regular intervals, and when a stipe is sectioned a bundle of thecae can be seen. The colony, or rhabdosome, of the graptolite was constructed from a set of stipes arranged in characteristic patterns. In benthic graptolites this pattern is often irregular in detail, and the most common form is of a wide cone, with the stipes held together by a set of binding dissepiments. The rhabdosome was fastened to the sea bed in life with a holdfast developed from the sicula, a conical theca that was the first part of the colony to skeletonize (Fig. 10.1a). In planktic graptoloids the holdfast was replaced by a nema or virgula extending from the top of the sicula. This feature is usually a simple thread, but can have vanes or other additions. Stipes were built out from the sicula in extremely regular patterns, and are made from only one type of theca per species (Fig. 10.1d). In detail, the construction of the colony was in two parts. First, the main shape was built from a series of half rings of collagen plastered on to the thecal apertures. Then, a second phase of consolidation and strengthening involved the addition of collagen bandages to both sides of the thecal wall (Fig. 10.1b). A detailed terminology has developed for describing the number and attitude of stipes on a colony. The most important elements of this scheme are shown in Fig. 10.1c. It is inferred that there was a soft-part connection between all of the zooids in the colony, and that one zooid inhabited a single theca. The shape of the zooids is unknown in detail, but is thought to have been similar to the appearance of modern pterobranchs. Fig. 10.1 The main elements of graptolite hard-part morphology: (a) dendroid; (b) graptoloid; (c) terms for describing the orientation of a graptolite stipe; and (d) different thecal types, left to right: glyptograptid, dicranograptid, climacograptid, hooked monograptid, and enrolled. What are the morphological features of graptolites?